Can I Hunt with my Cowboy Action Guns and Loads? Should these guns and loads be used on game? Tempting is certainly not to strong a work to describe a Cowboy-Action shooter’s desire to bust something with his guns besides balloons and paper plates. After all, these guns are newly made, Action participants fire more rounds through them in a single event than hunters do in years; and aren’t these more-or-less the same loads that were used to tame the American West? All of this is quite true, and the answer is, “it depends.” Forget using all pistol calibers below .44-caliber for use on anything but small game. They are just too, too puny. With these you can take jackrabbits, but that is about it. Moving up ever slightly in power to the .44 Henry Rimfire, this one is a dud too – small game only. I don’t care of Kevin Costner was shown killing a buffalo in its tracks with one shot in “Dancing With Wolves,” that puny .44 would have just made that huge buffalo mad. I have killed bison, and I did not do it with a .44 rimfire. Georgia doe taken with home-cast bullets in black-powder equivalent loads in .45-70. The .44-40 and .45 L.C., can be used with considerable care on deer-sized game in states where they are legal; but SHOULD YOU. 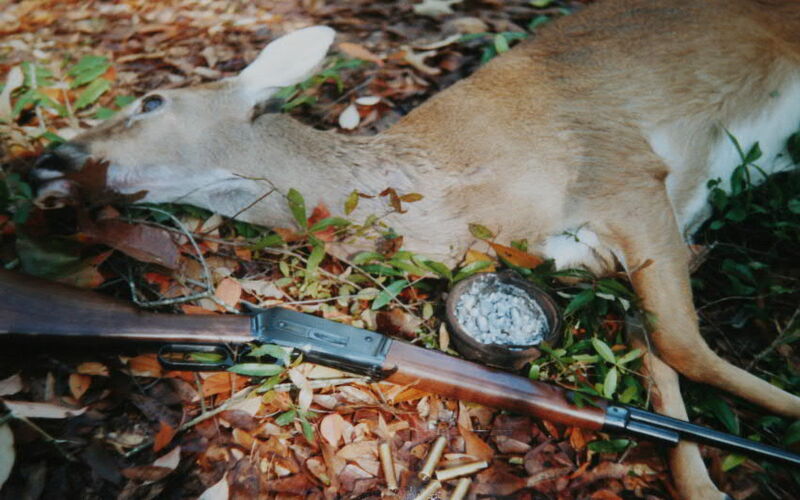 With hot loads of smokeless powders and expanding bullets their performance is considerably enhanced to bring them up to 30 and 50-yard deer killers, provided bullet placement is OPTIMUM. Some guns, particularly the weak Winchester 1873s, should not be stressed with anything more than low-pressure loads. Working up to a load with deer-killing potential, the .45-60 used in the 1876 Winchester is generally considered a weak deer cartridge. I owned an original and successfully used it on deer with 300-grain jacked soft-points designed for the .45-70. The smaller cartridge does not have the penetration of the .45-70, but with careful shooting at close range it can get the job done. It is good to have a dog handy to trail up your deer as it is likely to run away to die when using any solid lead bullet at relatively low velocities. Since I was about 12-years-old, I have never been without a .45-70. For a magazine article, I cast some lead bullets over a wood fire in my backyard and use a Browning-made Winchester 1886 ExtraLite to shoot a deer about 200 yards from my house. It took five shots to kill that deer. Those heavy lead bullets punched holes through it, but did not kill. This is what nearly always happened if these bullets did not hit sufficient bone to expand them. To the old-time buffalo hunters it made no difference if the buffalo died six hours after it was shot or not. They would just skin it later. Modern hunters want more rapid kills. The bottom line is to use expanding bullets that you reload or modern smokeless loads for best game-killing results with your ’86s, Sharps, Ballards, Remington Rolling Blocks and the like. With shotguns, the picture is different. So long as you remember that you must use non-toxic shot on waterfowl, these may be used on small game. The best of the cowboy guns pattern well, but the originals, and close copies, have such bent stocks that is it very difficult for modern shooters to hit anything. These old guns were meant to be shot in the head-erect position. It was ungentlemanly to have the cheek pressed down on the stock. A great submit by you my friend. We have bookmarked this page and will appear back following several days to examine for any new posts that you simply make. Well, just got back from a muzzleload hunt. I used solid lead .451, semi-wad cutters that were 240 grain. Had two 50 grain Triple Seven pellets. The deer was at 25 yds at the shot, the bullet went through the front leg meat (not bone), blew a 1″ x 3.5″ hole in its facing ribs, blew up its heart and part of it exited the other side. It went 35 yds and dropped. I would say that was pretty efficient. I say go for it! That is a reasonable load from a muzzleloading gun with the equivalent of 100 grains of powder and a 240-grain bullet. 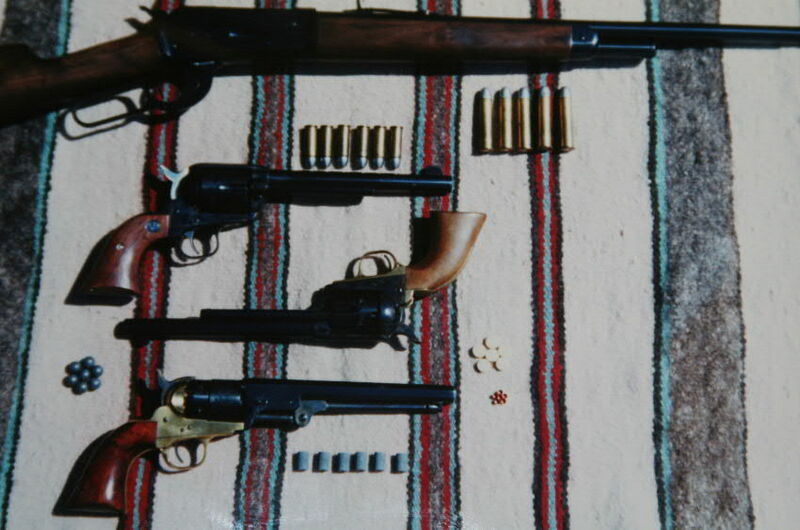 What I am suggesting that people not use are low power round-nosed .44-40s, .45 Long Colts and the like. Your muzzleloading load was better than the usual load in the .45-70 shot from a rifle and is certainly ample for a close-range deer. The round-nosed .45-70s will kill quickly with solid bone hits and tear through a deer end-to-end. The flat-nosed and hollow pointed bullets are faster killers.